336p. Little, Brown. Mar. 2019. Tr $16.99. ISBN 9780316521901. 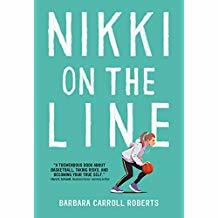 Gr 5–7—Nikki is excited to join an elite eighth-grade basketball team, but struggles to find her place among so many talented— and tall—players. Nikki's mother is supportive but clueless when it comes to athletics, and Nikki wonders if her "sports gene" came from her biological father, a sperm donor whom she has never met. Nikki bonds with new friend and potential crush Booker, who was adopted after his parents succumbed to drug addiction. Basketball fans will appreciate the detail poured into team strategies, training drills, and the games themselves, which are fast-paced and dramatic. Nikki's determination makes her a sympathetic character, and even non-players should identify with her struggle to balance a consuming hobby with other commitments. Nikki's grades and friendships suffer, and she begins to lose her love of basketball. Nikki and Booker are both white. Nikki's best friend Adria has a Brazilian mother, Coach Duval is described as having brown skin, three girls on the team are described as having African American hairstyles, and another teammate, Kim-Ly Tran, has a Vietnamese name. Written in clear, accessible language, the story successfully utilizes sports to address the push and pull of establishing an individual identity, and how one can benefit a team. VERDICT This accessible coming-of-age story comes alive in its descriptions of basketball and the game's resulting life lessons. Recommended for most collections.